The first Zoetis AQHA Ranching Heritage Challenge in Montana was the biggest of the year with more than $15,000 on the line and 60 entries in classes from boxing to ranch horse pleasure to working ranch horse. "Hesa Hickory Cat is a horse I showed last year in (reined cow horse) futurities," Matt said of his 4-year-old winner. 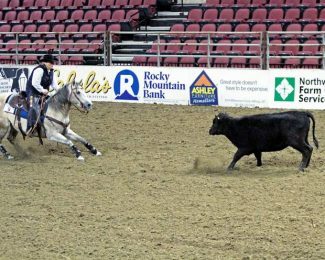 "He wasn't real strong in the reining so we haven't shown him much, but I won Wyoming's futurity and Colorado's cow horse futurity. I haven't shown him but maybe half a dozen times this year. (Today), I went in there and he was outstanding in the reining, which was a huge shock – usually he boogers somewhere – but he stayed with me and was really good." "Then they kicked the cow out and he's usually good with a cow," Matt said. 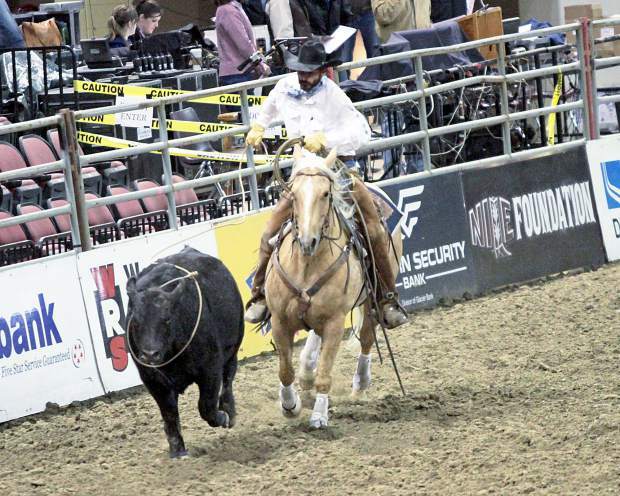 "We boxed him around and got our two turns and went to the roping. The cow stayed true and honest and we got him caught, and 'Hick' went to the ground." Matt didn't have time to celebrate before he turned around and rode in as the first exhibitor in the 5/6-year-old class. His first ride was the winning one on This Cats King, another palomino gelding by WR This Cats Smart and out of a Shining Spark mare. "I showed him yesterday in open hackamore (at the NILE), and he was good," Matt said. "We won that, and then we came here today, and I jumped on him and went in there and showed him. He's easy to show. He was decent in the reined work. We were a little long down the fence. We went around the corner, but he went right there and stayed hooked for a big turn for the second turn. We rolled into the roping and he rated off and was good." This Cats King and Matt also won the 5/6-year-old class during the Zoetis AQHA Ranching Heritage Challenge at the Snaffle Bit Futurity in Reno, Nevada. Wagonhound's Matt Kelly won the limited open 4-year-old class on "Louis" in 2013 at the Fort Worth Stock Show. But when the horse's show career is over, he won't be heading back to the ranch to work cattle. The ranch has a different career in mind for him. "Our end goal for him is to be the boss' wife's personal horse, so we'll keep hauling him and keep him fit and showing so he's ready for her when she's at the ranch," Matt said. Matt was also second in 5/6-year-old class on The Smiling Colonel, a 2009 black gelding by Just Plain Colonel and out of HR Smiling Light by Grays Starlight. He was bred and is owned by Wagonhound. The cowboys call him "Snowflake." "I've got two yellow horses I've been hauling all year – two yellows and a black – two colors that are unusual, and I've got them," Matt said. "We did the reining pattern they had set for us and going into the cow work, he was good, and the fence work was good," Chance said. "He did really well considering this is the first time I've ever shown him." "Right before I show, I ride him every day, but he's a ranch horse, so I've got other stuff I need to ride, too," he said. "It's a good show. We'll be back, I'm sure." Another cowboy making his challenge debut was Eric Branger, who has been riding Shining Fever for about a year and a half for AQHA Ranching Heritage Breeder Cowan Select Horses of Havre, Montana. The pair won the limited open 4-year-old competition. "We've done a little (National Reined Cow Horse Association) with her, and I started roping on her last winter, trying to get her ready for this," Eric said. "She took to it." Shining Fever is a 2010 buckskin mare by Playboys Buck Fever and out of Shining Shiner by Shining Spark. "Gretchen" was bred and is owned by the Cowans. "I was just trying to be real calm with her," Eric said. "She's a strong stopper so I just wanted to make sure her stops were good. And then just get her lead changes correct and the spins nice and easy and make sure I didn't miss the cow." Gretchen is a working girl at home on the ranch. "We've moved cows and wrangled horses on her," Eric said. "We've used her for brandings and things like that, too. She's a pretty good mare." Horse owners C.J. and John Wolfe of Roundup, Montana, bought Weavers Smart Site from AQHA Ranching Heritage Breeders Stan and Nancy Weaver of Big Sandy, Montana. John had intended to ride the mare himself, but after he dislocated an ankle, he sent "Bailey" to Tim Unzicker of Roundup for training. The Wolfes liked what they saw, and entered her in the 5/6-year-old open working ranch class and the open ranch pleasure class, which she won. "As of next month, she'll have one year of training," C.J. said. "Nothing else." Weavers Smart Site is a 2009 bay roan mare by Merada Ima Boonsmal and out of SNW Smart In Heaven by Ima Bit Of Heaven. "It's been kind of a Cinderella story with her, because she was so far behind (the other horses)," John said. "And she's come along so good. What you saw out there today is what she is. She's just so nice." John, now recovered from his injury, is itching to show himself. "Next year, she's my horse," he said. "We bought a WR (This Cats Smart colt) from the Wagonhound, and he's with Tim now. We thought we'd do better in the cow work, but we'll take this." AQHA Ranching Heritage Challenges are limited to horses bred by AQHA Ranching Heritage Breeders. For a complete list of breeders, go online to http://www.aqha.com/ranching. –Reprinted with permission from the American Quarter Horse Journal.